Read through the premise of the game and identify the task you are asked to solve. Create the roster of elements you are asked to place into groups. You may also want to create a second list of the groups into which you will be dividing the elements. Create a diagram that will best represent the multiple groups into which we will arrange the elements of the game. Within each group, represent the number of elements that can be possibly placed in that group. Like the strategy we use for other games, write the conditions for the game to the side of the diagram. Look at the conditions that are written at the side, and see which ones can be transferred into the diagram. Always start with the conditions that are fixed. Once you have transferred the information from the conditions to the diagram, look over the conditions again to see if any new information can be deduced when considered together with your diagram. Determine what additional information (if any) is provided by the question itself. Add that new information provided by the question to the diagram, and again review the conditions on the right of the diagram and see if you can make any more deductions about elements that can be put into a group on the diagram. Solve the question by consulting your diagram. If necessary, check each possibility against your diagram. When you proceed to the next question, remember that any information that was given by the previous question must not be carried over to the next question. Ten freshmen students, L, M, N, O, P, Q, R, S, T, and U, arrive at Egghead University for their first term of college. They are told that they have been assigned to one of three dormitories: Genius Hall, Intellectual Center, or Brainy Building. At least three of the ten students are assigned to each dormitory. M, P, and U are all assigned to separate dormitories. L, N, and T are all assigned to the same dormitory. Both O and R are assigned to Intellectual Center. Now that we have added the new information provided by the question to our diagram, let’s review the conditions we have on the right of the diagram and see if we can deduce anything further about how to place the students in the groups. Again, let’s look at the requirement that L, N, and P are in the group of four students. Is there room in the Genius dorm for four students? No. Therefore, we must place the set of L, N, and T into the Brainy dorm and also move into that dorm the fourth space, which would be held by U or P.
First, what are we being asked to do here? Out of a group of ten students, we need to separate them into three groups based on the dormitory in which they will live. Once we have read through the premise of the game, realized it is a grouping game, and identified the task we are asked to solve, the next step in our game strategy is to create the roster. In this case, the roster of elements is the list of students. For grouping games, you may want to create a second list of the groups into which you will be dividing the elements. 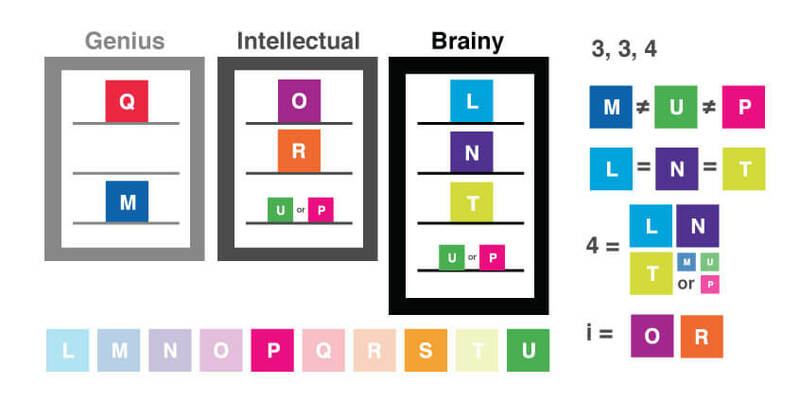 In this case, the groups are the three buildings: Genius Hall, Intellectual Center, or Brainy Building. Notice that we represent the group names with lower case letters, rather than the capital letters we used to represent the students. It’s always a good idea to make your abbreviations for the roster of elements and the abbreviations for the groups look different so you don’t run the risk of mixing them up during the process of solving the game. Okay, according to our game-solving strategy, our next step is to symbolize the conditions. In this case, one of the conditions is actually contained within the premise of the game: we are told that at least three students are assigned to each of the three dormitories. What additional information can we deduce from that statement? Well, if there are ten students, and at least three will be in each dorm, that would give us three students in three dorms, for a total of nine students. Since we have ten students, not nine, we can conclude that one of the dormitories will have four students, and the other two will have three students each. We don’t know yet which of the three dormitories has four students, and which two have three, but for now, we can summarize this simply as 3-3-4. If P ^U, if U ^P. Now, let’s create a diagram to help us think about the problem. What kind of diagram will best represent the arrangement of elements in the game? Unlike ordering games or network games, we don’t need a complicated diagram. 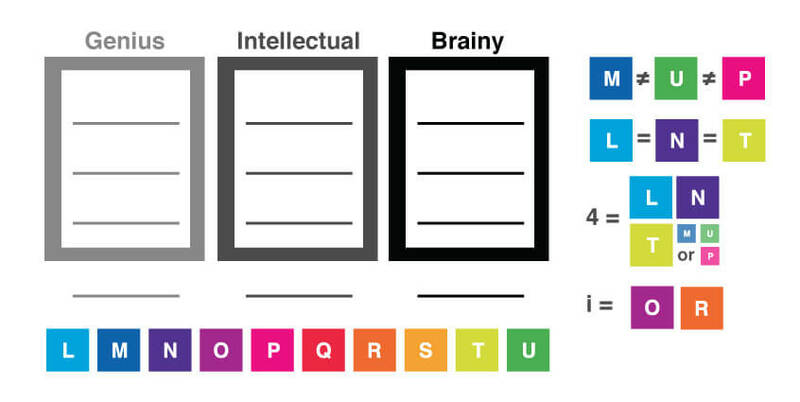 We only need to represent our three groups and we can just use three boxes for this. (Note: in this diagram the groups are labeled with their full names for clarity, but on the actual exam, you will probably want to use the abbreviations in order to save time.) Within each group box, we will put three horizontal lines for the three elements we will place in those groups. (Remember that one of the three dorms has four students. Since we don’t know yet which one, we can represent that underneath each of the three group boxes with a horizontal line and a question mark.) Like our other games, we will write the conditions for the game to the side. If we look at the second to last condition we have written to the side, 4 = L, N, T and (M, U, or P), we remember that L, N, T and one other student are in the dorm that has four students. Because we already have O and R in the Intellectual dorm, there is not enough space left in that dorm. Therefore, we know that the Intellectual dorm does not have four people in it, so we can eliminate the line from underneath this group. 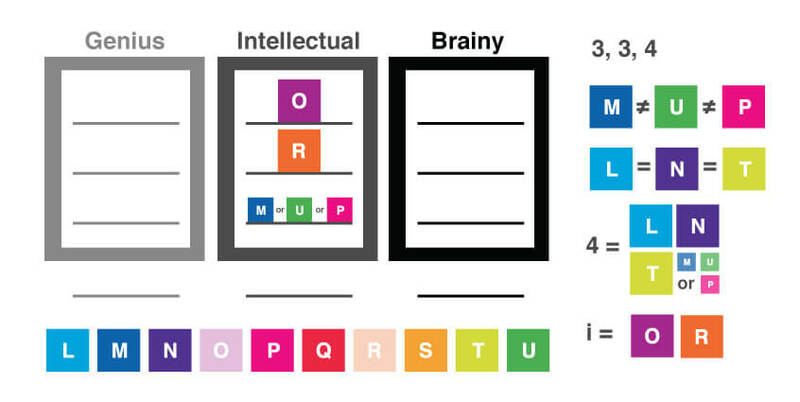 Further, if we look at our second condition which states that M, U, and P must be in separate groups, we know that one of these students must be the third one in the Intellectual group. We can represent this possibility as M / U/ P on that third line, symbolizing that one of these must be in this group. The next step is to look over the conditions again to see if any new information can be deduced when considered together with your diagram. We know that L, N, T and either M, U, and P make up the dorm that has four of the students, but we don’t know yet if these four are in the Genius or Brainy dorms. It seems as though this is all the information we can fill in so far. If M and Q are assigned to the same dorm, which of the following cannot be true? (A) O and U are in the same dorm. (B) R and P are in the same dorm. (C) Q and S are in the same dorm. (D) U and L are in the same dorm. (E) M and T are in the same dorm. After reading the question, the first step is to determine what additional information is provided by the question itself. In this case, we are told that M and Q are assigned to the same dorm. If we look at our diagram, M and Q could fit into either the Genius or the Brainy dorms. If we look at the answer choices, we see that we are not going to be asked which students are in specific dorms, only which students are assigned to the same dorm. So, let’s arbitrarily insert M and Q into the Genius dorm to start. Once we have placed M into the Genius dorm, then we can remove it from being a possibility in the Intellectual dorm. 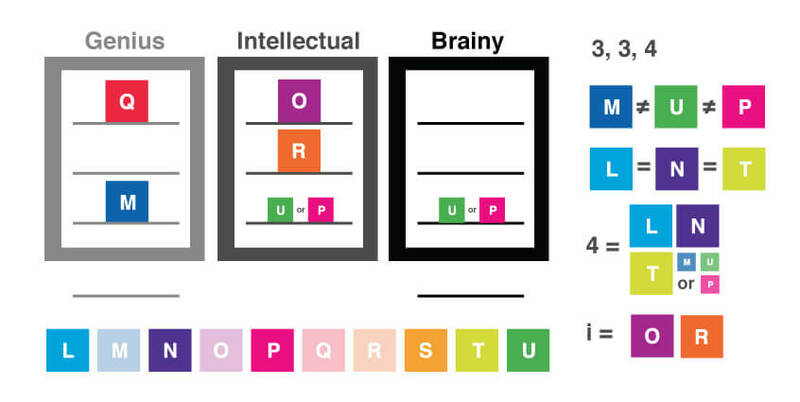 We can also add the possibility of U or P into the Brainy dorm as well. Now that we have our diagram, let’s look at the conditions we have written at the side and see which ones can be transferred into the diagram. As before, let’s start with the conditions that are fixed. 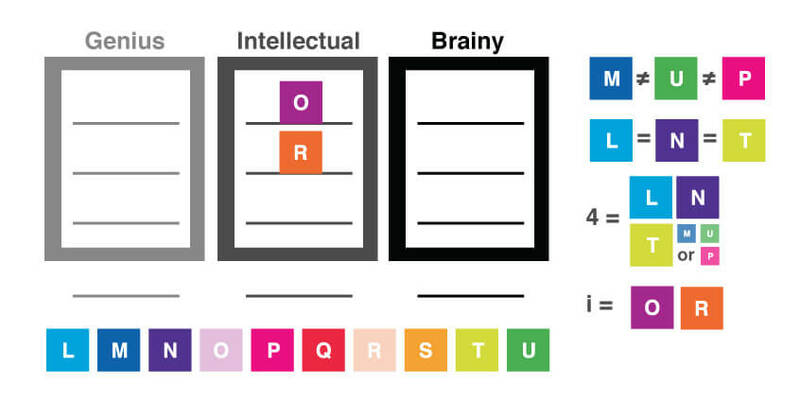 Starting with the last condition, we see that O and R will be in group i (Intellectual), so let us write O and R in two of the lines in the Intellectual group. Let’s try a second question for the same game. What do we need to remember before utilizing our same diagram to answer the next question? Any information that was given by the previous question must not be carried over to the next question. Only information from the original premise and conditions can be applied to each question. Which of the following must be true for the group of ten students? (A) Exactly three students are assigned to Genius Hall. (B) Exactly three students are assigned to Intellectual Center. (C) Exactly three students are assigned to Brainy Building. (D) Exactly four students are assigned to Genius Hall. (E) Exactly four students are assigned to Intellectual Center. We are asked about how many students can be assigned to each dorm. As we’ve drawn it, the group of four students could be in either Genius Hall or the Brainy Building, not in Intellectual Center. 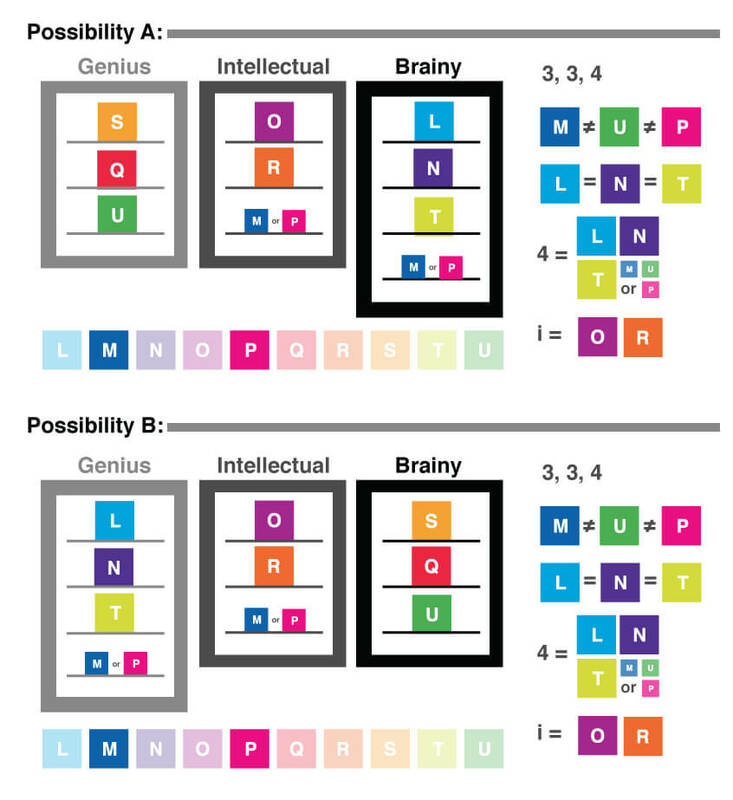 Choice B, that exactly three students are assigned to Intellectual Center, is the correct choice. Choices A, C, and D are all possible arrangements that satisfy our conditions, but we are asked which choice must be correct, not what is merely possible. Choice E is not correct, since we know that only three students are assigned to Intellectual Center. Let’s try one more question for this game. If U is assigned to the same dorm as S, how many distinct groups of students could be assigned to Genius Hall? These particular types of questions are quite common in the games section and can be time-consuming because we are asked to figure out how many possibilities will satisfy a given arrangement. Let’s start with what we know. In the question, we are told that U and S are in the same dorm. Now, we know that they can’t be in Intellectual Center since we don’t have enough spaces available to fit two students in — only space enough for one additional one besides O and R. Therefore, U and S must be in either Genius Hall or in Brainy Building. Since we don’t know which, we need to draw out both possibilities. 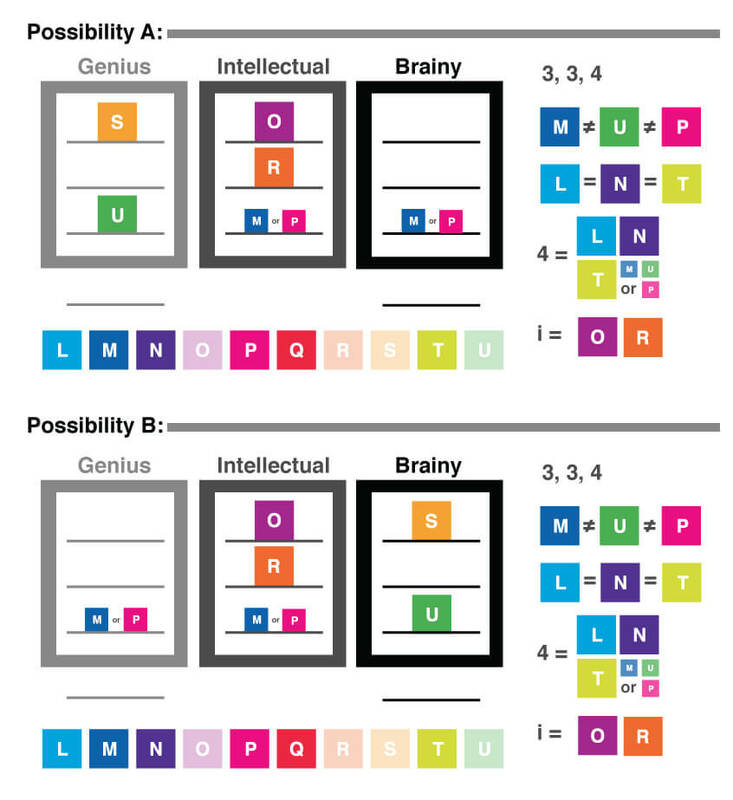 We will label these possibilities A and B for locating them in Genius Hall or Brainy Building. Let’s look at our conditions again. We know we have the block of four to fit into a group. Can the group of four students be in the same dorm as U and S? No. Let’s then put the group of four into the other building. Remember, we need to do this for both possible arrangements, A and B. 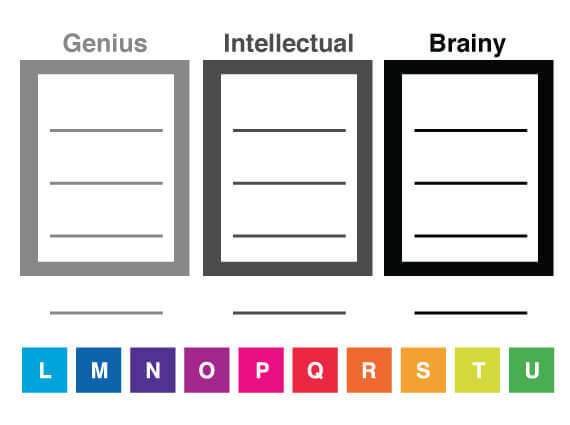 When we do this, we see that we have one blank remaining, which we can fill in with the one remaining student, Q. So, we are asked how many distinct groups of students could be assigned to Genius Hall. In possibility A, where S, Q, and U are assigned to this dorm, there is only that one set. In possibility B, which we have assigned to L, N, T and either M or P, there are two possibilities (L, N, T, and M or L, N, T, and P). Therefore, we have a total of three possible arrangements of students in Genius Hall, so the correct choice is C.